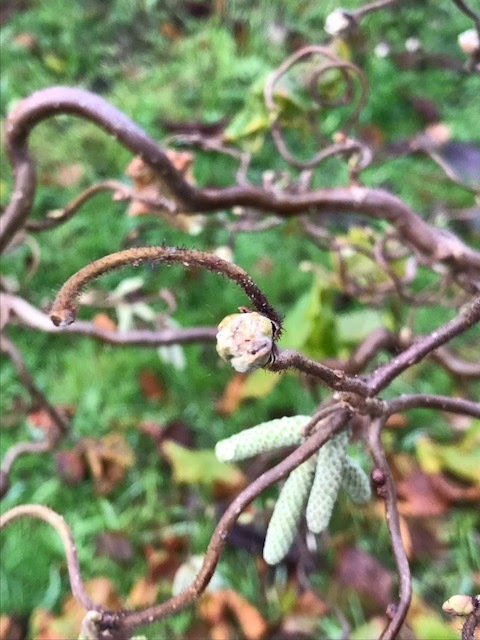 I think my Corylus avellana 'Contorta', or the contorted Hazel to its friends, must be approaching seventeen years old now. I bought it from a magazine offer alongside a bamboo and an acer that are now long dead. 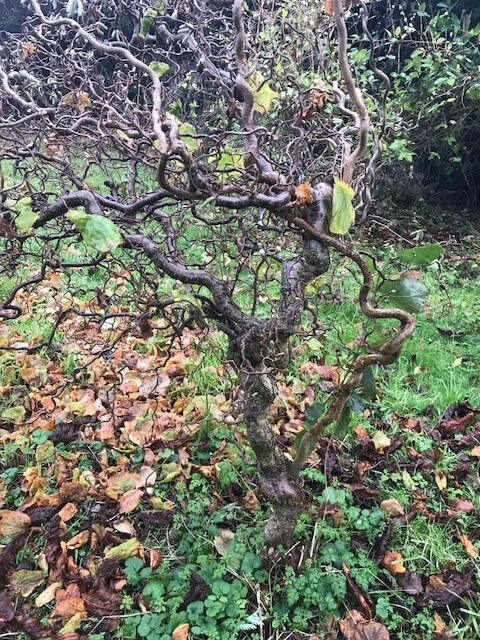 The contorted hazel though was made of sterner stuff and whilst not the fastest of growers, it determinedly kept going. For the first seven years or so the hazel lived in a pot by the front door. It was probably around 40 cm high and little more than a twisty twig, but I loved it nonetheless. 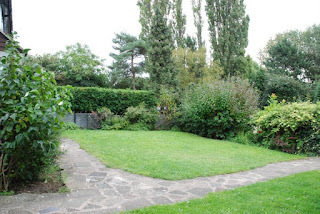 Fast forward to moving into this house/garden and I decided it was time it found its forever home and was planted into the ground. 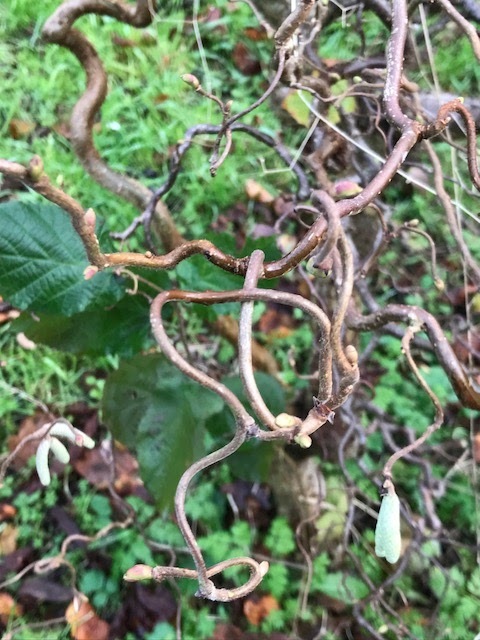 The hazel is situated in the Wild Garden close to the top of the garden. It has now reached about 90 cm or so high but it has filled out well. It looks good all year round, but in winter when the leaves fall its twisty beauty is fully revealed. I was wandering around the garden the other day and I stopped to appreciate the hazel. I walk past it often, but I do not think I pay it attention often enough. I get a little excited when its tiny red flowers appear, but I have not stood and considered it for quite a while. It was time that I did. 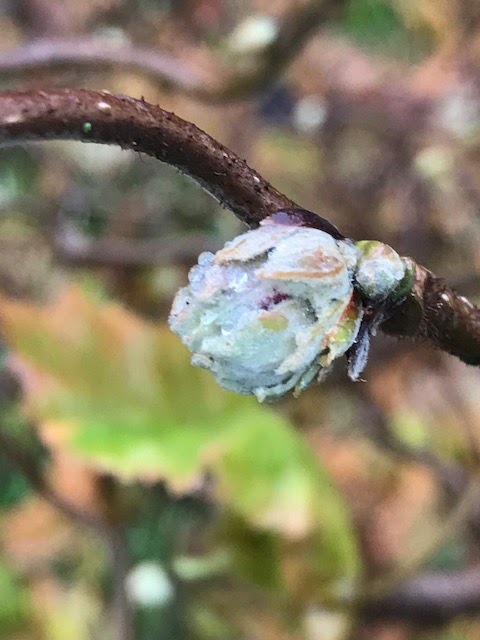 It currently sports these plump buds, it is settling down for the winter cold and already preparing for the spring. 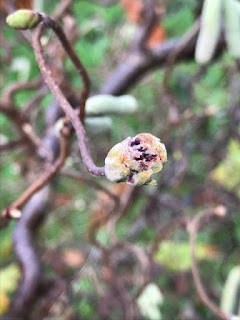 The male catkins are also forming preparing for breeze to carry their pollen into the flowers. The twigs are delightfully contorted (hence the name). It curls and whirls in a wire-like fashion. When the temperatures really drop the spiralling twigs and branches get picked out carefully by frost which gives it a very structural presence in the garden. 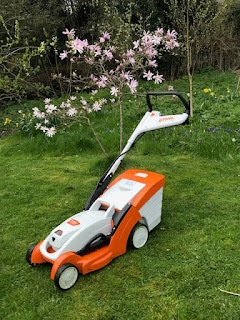 It is what is generally referred to as 'a good doer'. A good shrub is worthy of acknowledgement - so Corylus avellana 'Contorta' I salute you. 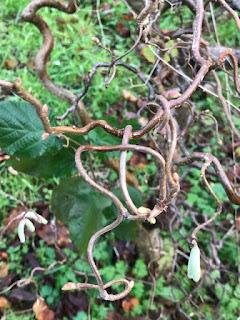 I have tried to grow twisted hazel once or twice but always had problems with suckers which were straight hazel wands. Any idea how I can avoid this happening if I try again? Mine has a tendency to throw up straight suckers as well, I just cut them off as close to the base as I can. It usually only does a couple a year and it always surprises me how tall they can get before I notice! What beautiful, curly twigs! I'm sure it must be a sight when the frost sets in. 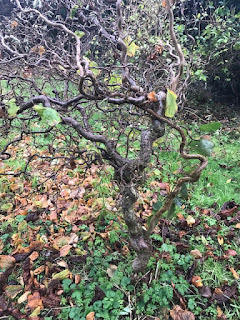 This twisted hazel must be a beauty in your wild garden and I think plants with memories from where you bought them or got them have an added value. I often walk in my garden musing about my plants, how long I have them and how they came into my garden, love it.